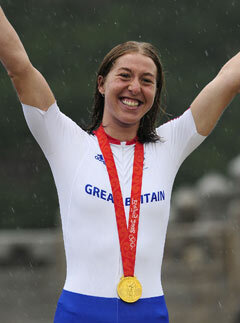 British women are making waves, quite literally, at the Olympic Games after a weekend of success in Beijing. Saturday saw cyclist Nicole Cook (below) launch Britain’s Olympic medal wins when she took victory in the women’s road race. Cooke braved torrential rain during the 78.5-mile race, which began in the Chinese capital and ended at the Great Wall. Meanwhile, this morning two more female British hopefuls shone in the pool. 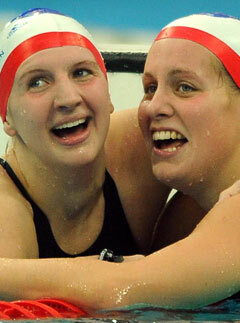 Rebecca Adlington (below left) made a thrilling surge in the women’s 400m freestyle, to take a gold medal. The 19-year-old from Mansfield, overtook America’s favourite, Katie Hoff, in the closing stages of the race and in so doing, became Britain’s first female Olympic swimming champion for 48 years. There was more cause for celebration, however, as Britain took third position in the same race. GB team-mate, Jo Jackson, joined Adlington on the podium to receive her bronze medal.